Sometimes silence is a good sign. When it comes to listening to my husband breathing, it’s not. One quick X-ray later and we discover that his right lung had collapsed. There was also air putting pressure on his left lung. The fix was easy. The doctor inserted a slender tube into his chest, sucking out the air. His lung reinflated in a matter of minutes. I caught the doctor later and asked her why this had happened. When the pain started, he’d been watching TV. She shrugged and admitted that sometimes it was just something that happened to men who are tall and thin. Of course, the answer to the question of “How do we avoid this?” was … don’t be tall and thin. Not the most satisfying answer. Modern medicine at times can feel vague and frustrating. But there is a new, growing segment that specializes in pinpointing the exact problem and the treatment that works best. No one likes going to the doctor. It’s not just the expense or the waiting. It’s not knowing precisely what’s wrong. And then getting a treatment that has maybe a 50% chance of working. Precision medicine stands to completely revolutionize the health care industry. Through closely examining our individual DNA and trillions of bytes of collected data, doctors can precisely identify what is wrong with a patient. What’s more, the doctor can tailor the patient’s treatment to their specific strain of an ailment. Precision medicine aims to end the broad, one-size-fits-all medicine that we’ve suffered under for centuries. And we’re just at the beginning of this revolution. Global Market Insights released a report revealing that precision medicine was a $39 billion industry in 2015. By 2023, precision medicine should grow to $87.7 billion. 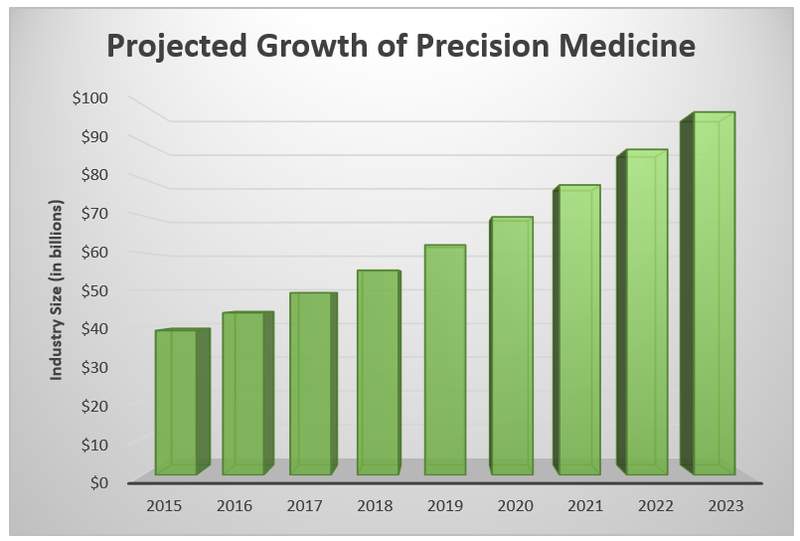 Credence Research expects precision medicine to swell to $98 billion by 2023, with a compounded annual growth rate of 12.3% from 2016 through 2023. Cancer treatment has dominated precision medicine over the last several years, accounting for roughly 30% of the sector. It will continue to drive demand for personalized medicine. In 2015, the global market for cancer treatment was $107 billion. It’s expected to reach $161 billion by 2021. As spending for cancer treatment expands, so will spending in precision medicine as it proves to be a more effective course for beating this disease. In addition, new advancements in health care technology will push spending in precision medicine. Companies are developing tools that will work through massive amounts of data. These tools locate commonalities between patients with similar ailments and their reaction to specific treatment options. Pharmaceutical companies are focusing on treating patients with specific genetic markers for improved results. In fact, precision medicine has the potential to touch nearly every facet of the health care industry. With this explosive growth underway, it’s important to know which companies are poised to lead the charge forward within the precision medicine sector. That’s why Paul Mampilly, editor of Profits Unlimited, has pulled together a special report identifying the next company that is set to skyrocket on the back of massive growth within precision medicine. If you would like to get a copy of this report, click here. We’ve already witnessed revolutions hit industries with the creation of the combustion engine. And then again with the advent of the internet. Precision medicine stands to change the entire medical industry. You don’t want to miss your chance to take part. P.S. Paul’s new video report explains why precision medicine will be more important for your health than every drug, vaccination and medical device … combined. To watch Paul’s shocking video, click here.